You’ve spent a lot of time choosing a child care setting that you hope will work well for your family. Now it’s time to focus on building a good relationship with your child care provider so the two of you can work together to make the experience successful. 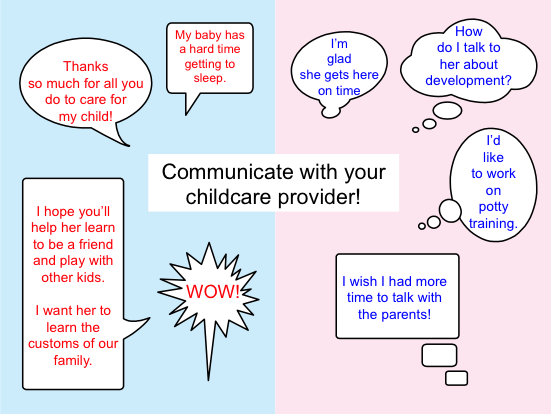 Your child care provider wants to build a helpful relationship with you, too, because many important issues come up in child care that the two of you will need to discuss. All relationships take attention and time, especially at the beginning as you get to know each other, so don’t assume that things will happen naturally. Here are some suggestions for building a good relationship. 1. Keep your contact information current and tell your provider if your regular schedule changes. 2. Follow your provider’s policies: drop off & pick up on time; leave time at drop-off so you aren’t rushed; keep up with the supplies your provider requests for the care of your child; notify her of any changes in your schedule as soon as you can; follow the policy about illness so others don’t get sick; always have extra clean clothes for your child; and be sure to pay on time. 3. Your provider has the needs of several children and their families to keep in mind every day and her time is limited so if you need to talk, ask when a good time would be. 4. Be sure and tell your provider about anything going on at home that will influence your child’s behavior. Examples might include: birth of a new sibling; change in employment of a family member; military deployment or return home of a family member; family stress; food insecurity; divorce; or death of a relative. 5. Early in the relationship describe as much about your child as you can – her personality; favorite activities; things she really doesn’t like; fears; strengths; things she’s learning to do; and how she communicates. 6. Ask your provider what she is learning about your child and get her ideas. Remember, you are the expert on your child; she is an expert on child development. 7. Show her you appreciate what she does by thanking her often and praising her work. For her birthday and holidays, perhaps you and your child together can make a painting or drawing; pick some flowers; sing a song. 8. If there’s a problem, bring it up early and work together to find solutions.